Today I’m handing over the blog to the very lovely and talented Sarah of “Say! Little Hen“. The reason why is that she can make bread, like proper sourdough, and she explains it in such a simple way that even I am game to try it myself, something I’ve always been a bit too intimidated to do before now. Sarah shows us how to slot bread making into everyday life and takes away some misconceptions about bread baking too. 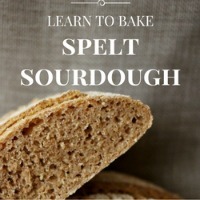 Sarah has also written an e-Book on how to make Spelt Sourdough and she is very kindly giving all BE&S readers a 10% discount to make it even easier for you to say “why yes, I WILL make some sourdough”! It seems odd to think that most of us don’t know how to make such a basic, everyday staple anymore – I’m talking about bread of course. It’s something that most of us consume daily – or at least weekly. In days gone by, homemade bread was common fare. Everyone knew how to make it, and it was part of everyday life. The silliness of all these modern misconceptions is that baking bread doesn’t have to be complicated – and it doesn’t take loads of time. I’m as busy as the next person, but I’ve been baking my own bread for years. Many of those years were spent making yeast bread, but a few years ago I discovered sourdough and have now moved completely away from all other forms of bread baking. Why? Well, for one sourdough is the most delicious kind of bread you’ll ever have. (True!) And another reason is the convenience. That’s right – for me sourdough baking is easier to slot into everyday life than conventional bread baking. Mixing up the dough of the evening, letting it bulk prove overnight and then in the morning kneading it (only once), shaping and letting it rise a final time before baking – it’s a relaxing, enjoyable and highly addictive process. What if I don’t have time to hang around to bake the bread that morning? Well, there’s a simple solution to that. I simply knead and shape the bread (takes less than five minutes), and then place the shaped loaf to prove in the fridge for as long or short a time as required. If I’m not going to be home all day, in the evening I simply remove the bread from the fridge, and let it sit on the bench for around two hours before baking. There are other proving and baking schedules that I’ve created too (these are available in Spelt Sourdough Made Simple), which I choose from depending on my needs. This marvellous flexibility is just one of the things that made me fall in love with baking sourdough. My favourite kind of sourdough to bake is with spelt. It makes the yummiest loaves, and requires a few changes in method and technique to white flour recipes. I went through the agonizing process of baking lots of bad spelt sourdough before I realised that I couldn’t just use spelt flour in white wheat flour recipes. Now, I enjoy delicious well-risen loaves of whole spelt sourdough every week. Sourdough is incredibly flexible. Mix up your dough in the evening, then the next morning knead and shape it into a loaf. It’ll take about two hours to rise and then you can bake it. If you don’t have time to hang around, immediately after shaping, pop the dough into the fridge and bake it that evening. Sourdough freezes wonderfully. Choose one day a week to bake on, and bake multiple loaves. Enjoy one that day for lunch and freeze the rest as soon as they are cool. (You can freeze them whole or in slices). You can start your dough in the morning and bake it in the evening, or you could mix up the dough the evening before and then start your day off with the calming task of kneading and shaping bread. (It’s one of my favourite ways to start the day!). Keep your sourdough starter or “mother” in the fridge, only bringing her out when you want to bake. This means that you don’t have to bake every second day. If you want to mix up your dough in the evening, then get your starter out the evening before and give it a feed. The next morning, feed it again and by that evening it will be large enough and bubbly enough to bake with. When you’ve taken out the starter for your bread, give your “mother” one final feed and pop her back in the fridge. She’ll be happy for about a week, when she’ll want another feed. So, ready to give sourdough baking a go? You’ll find all you need to know inside Spelt Sourdough Made Simple – from your own sourdough starter recipe to a variety of delicious sweet and savoury bread, bun and scroll recipes. There’s even a recipe for your own spelt sourdough flat breads and salad wraps! The recipes are designed to be used with all forms of spelt – either whole or white, and whole wheat flour too. They’ll also work for white flour, too. Thank you Sarah. I could definitely do with one of those fruit buns right about now. How good do they look? Are you game to try too? Click on the ad for Sarah’s e-book and use the code BEAS10 to get your 10% off discount and you can be enjoying some of this deliciousness in no time too. Sarah blogs over at Say! Little Hen, where she shares her love of wholefood baking, knitting & knitting patterns plus gorgeous pictures of her rural life in Northern Queensland. Sarah is also on Instagram and Pinterest with gorgeous pictures. Do you bake your own bread? Will you give it a try? Yum. I have always wanted to give sourdough a go. Actually I have a dried starter but am still intimidated. The only bread that I usually make is the no prove bake-in-a-french-oven-ciabata-like loaf or soda bread, but I do love sour dough and would love to get into the habit of baking bread every couple of days. I’d like to get into the habit too. I’m on the hunt for a starter. I would love to make my own bread – I keep thinking that I needed to get started but first I need a starter! This post is perfectly timed for me too! I’m on the hunt for a starter – I was given one years ago but was too scared to feed it – now I’m ready!! I’m afraid I’m not a big eater of bread. Which is a good thing as I was diagnosed as coeliac about 10yrs ago and most people complain about bread options, whereas it doesn’t worry me at all. No good for a coeliac but I did read somewhere that for those with gluten sensitivities sourdough was the best option if you did want bread. I should probably check that out again! I make my own sourdough bread from a starter every Sunday. It really isn’t much effort. I prove my dough overnight as well. Proving for 12+ hours is how bread used to be made, rather than the mass produced stuff we get, and it is meant to be much better for digestion. That’s great, once it’s a habit I guess it’s all part of the day. I’m really keen to try now. I’ve made focaccia and damper but never sourdough – I’m aiming to try! When we eat bread – we eat sourdough…And we end up going through a lot of it. It would definitely be handy to know how to bake our own. I know, I get it from the local growers market on Sundays but it would be lovely to wake up to our own! This sounds great and I’d love to try making my own sourdough. I’m keen to try too. Thanks for stopping by. Yum! We love sourdough and bake our own. It tastes so much better than store bought…because it’s made with love! That’s exactly it, made with love!